Detail from a painting by Russian Romantic painter Ivan Aivazovsky, depicting the arrival of Lord Byron at the at the Monastery of Saint Lazarus in Venice. Handwritten notes bound into a recently found copy of Paschal Aucher’s 1819 Armenian grammar. Seeking a respite from turmoil in his personal life, the restless Romantic poet Lord Byron made his way to Venice in 1816 for what would become an extended stay. Perhaps not surprisingly, Byron immediately began immersing himself in the intellectual, literary and artistic life of the city. In addition to frequenting establishments like the celebrated salon (conversazione) of Countess Isabella Teotochi Albrizzi, he also connected with a community of learned monks with whom he began his brief but serious study of the Armenian language. The story of his Armenian language adventure is told through Byron’s many letters to fellow poet Thomas Moore, his publisher John Murray, and the British politician and close friend, Sir John Hobhouse. Handwritten notes bound into a recently found copy of an Armenian grammar also tell the tale, and in many ways, become the book’s long overdue preface. Byron began his language studies at the island Monastery of Saint Lazarus, home of the Armenian monks of the Mekhitarist order. As he notes in his letters, he was looking for an amusement that would challenge his mind, and perhaps provided a much-needed distraction from his everyday troubles. By way of divertissement, I am studying daily, at an Armenian monastery, the Armenian language. I found that my mind wanted something craggy to break upon; and this—as the most difficult thing I could discover here for an amusement—I have chosen, to torture me into attention. It is a rich language, however, and would amply repay any one the trouble of learning it. I try, and shall go on;—but I answer for nothing, least of all for my intentions or my success.” —Excerpt from Byron’s letter to Thomas Moore. Venice, 5 December, 1816. Each day, Byron would arrive at the monastery by gondola. There he would spend many long hours perusing the treasures in the monastery’s library and studying classical Armenian under the tutelage of the polyglot priest, Father Paschal Aucher. While he had his struggles acquiring the language, Byron apparently persevered. My Armenian lectures still continue. I have about mastered thirty of the thirty-eight cursed scratches of Mesrob, the maker of alphabets, and some words of one syllable. My lessons are in the Psalms and Father Pasqual is a very attentive preceptor.” — Excerpt from Byron’s letter to John Cam Hobhouse. Venice, 19 December, 1816. The relationship between Byron and the Armenian monks quickly evolved into one of mutual benefit. Byron’s facility with Italian and English, not to mention his pocketbook, made him a valuable contributor to the monastery’s efforts to produce two grammars. The first was an English grammar in Armenian, entitled Grammar, English and Armenian (Venice: Printed at the Press of the Armenian Academy, 1817), which Byron financed, promoted through his publisher, and supplied some modest support to the English translations. This grammar project was already underway when Byron arrived on the scene. By way of requital for his instructions (as I could not offer sordid money to these friars), I have taken upon me the expenses of his Armenian and English grammar, which is now printing. It costs but a thousand francs to print five hundred copies, and being the first published in these joint languages, I think ‘I do the state some service,’ almost as much as Mr. Valpy of Tooke’s Court, who is Polidori’s printer.” —Excerpt from Byron’s letter to John Cam Hobhouse. Venice, 19 December, 1816. “I send you some sheets of a grammar, English and Armenian, for the use of the Armenians, of which I promoted, and indeed induced, the publication. … I still pursue my lessons in the language without any rapid progress, but advancing a little daily.” —Excerpt from Byron’s letter to John Murray. Venice, 2 January, 1817. 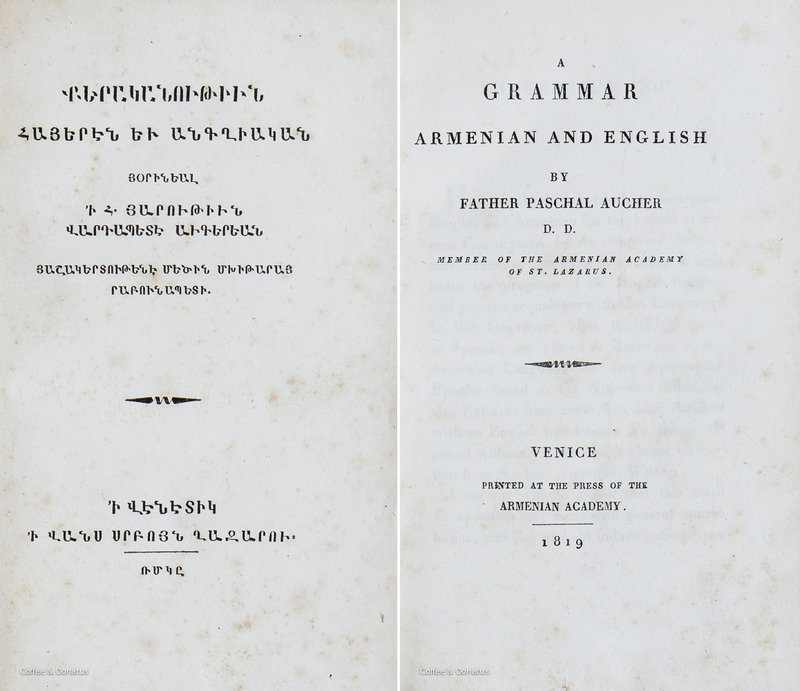 The dual Armenian and English title pages of Paschal Aucher’s 1819 grammar. The second grammar (pictured above) was designed to teach Armenian to English speakers. Entitled, A Grammar, Armenian and English (Venice: Printed at the Press of the Armenian Academy, 1819), this grammar may well have been conceived when Byron began studying at the monastery. Byron’s letters mention his assistance as a translator of Italian into English. Padre Paschal, with some little help from me, as translator of his Italian into English, is also proceeding in a MS. Grammar for the English acquisition of Armenian, which will be printed also, when finished.” —Excerpt from Byron’s letter to John Murray. Venice, 2 January, 1817. Interestingly, Byron also appears to have been hunting down Armenian types for the project. We want to know if there are any Armenian types and letter-press in England, at Oxford, Cambridge, or elsewhere? You know, I suppose, that, many years ago, the two Whistons published in England an original text of a history of Armenia, with their own Latin translation? Do those types still exist? and where? Pray enquire among your learned acquaintance.” —Excerpt from Byron’s letter to John Murray. Venice, 2 January, 1817. The copy of Aucher’s grammar pictured below has two neatly penned manuscript notes on a small bluish sheet of paper bound after the advertisement. 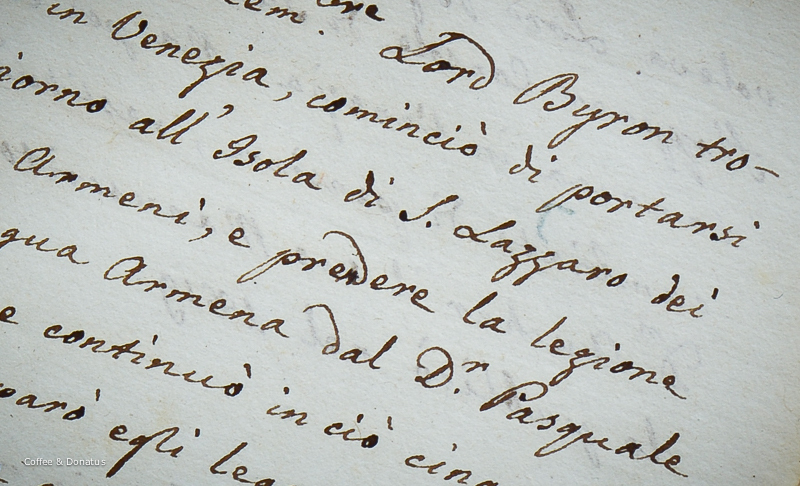 The first note, written in Italian, tells of Byron’s role in the making of the grammar. 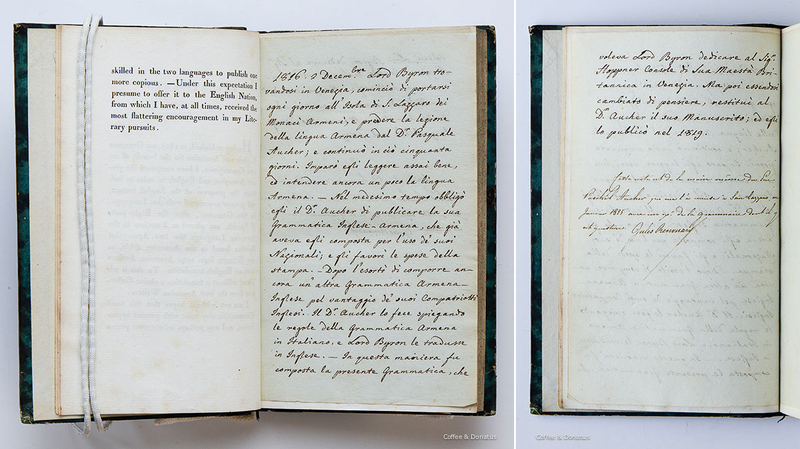 Notes in Italian and French bound into a copy of Aucher’s 1819 Armenian grammar (ca. 1825). It is interesting that the first note may have been penned by Byron’s teacher and the grammar’s only named author, Paschal Aucher (handwriting has yet to be verified). While the narrative seems to follow the story as we know it from Byron’s letters and other writings on the subject, the note presents an interesting opportunity to look for fresh clues about the history of this grammar book. For example, the note explains that the Armenian grammar in English was composed (not just published) at Byron’s urging. Byron’s letters are not specific on this point, although he gives quite a bit more detail about his role in the publication of the earlier English grammar for Armenian speakers. The remarks bring up new questions and possibilities. Could the grammar have been Byron’s idea? Did the idea for the grammar come about through the collaboration of Byron and Aucher? Or, was it perhaps conceived by Aucher before meeting Byron? The note, of course, offers no certain answers. The handwritten note also clearly states that Byron had drafted a preface for the grammar. This supports the assertion of Thomas Moor (friend, fellow poet and complier of Bryon’s posthumously published letters) that a fragment found among Byron’s personal papers was intended as a preface. The English reader will probably be surprised to find my name associated with a work of the present description, and inclined to give me more credit for my attainments as a linguist than they deserve.” —Excerpt from a fragment of a possible preface found in Byron’s personal papers, as noted by Thomas Moor, 1854. The note also mentions that Byron had a change of mind about authoring the grammar’s preface. Arpena Mesrobian’s paper “Lord Byron at the Armenian Monastery on San Lazzaro” (p. 33-34), suggests that that Byron’s preface was rejected because it contained language attacking the Turkish government. This apparently would have been problematic due to the ties between the monastery and the Armenian community in Turkey. One can only speculate on the circumstances surrounding the fate of Byron’s preface, but when the grammar book finally came off the presses in 1819, there was no explicit mention of Byron or his contributions. Instead, Aucher concludes a short advertisement that precedes the grammar, by expressing gratitude to the entire English Nation. I am not without hopes that this small Composition may meet with general approbation, and may perhaps induce some person skilled in the two languages to publish one more copious. —Under this expectation I presume to offer it to the English Nation, from which I have, at all times, received the most flattering encouragement in my Literary pursuits.” —Excerpt from Paschal Aucher’s Advertisement in his 1819 Armenian grammar. The second note is also interesting. Presumably written by Jules Renouard the Paris publisher (handwriting not yet verified), it gives attribution to the first note and tells of a meeting between Aucher and Renouard at the Monastery of Saint Lazarus in 1825. Byron had died just the year before, and Renouard would publish a funerary tribute to Byron that year entitled, Les Grecs. Tribut funèbre aux mânes de lord Byron, par Évariste (Paris: Renouard, Ponthieu, Mongie, 1825.). Of course, the note gives rise to more unanswerable questions. Did Renouard request the note and the grammar because he wanted an association copy for his collection (the Renouard family has a reputation as bibliophiles)? Or was he perhaps looking for information he could use for publishing a future edition of the grammar? It is curious that the first note is unsigned, though it is written in the third person and a signature would not make much sense. Thankfully, Renouard took the time to tell us something of the authorship of the first note. In March of 1817, Byron appears to have ceased his studies of Armenian due to health concerns, and possibly other complications in his life. The Armenian Grammar is published; but my Armenian studies are suspended for the present, till my head aches a little less.” —Excerpt from Byron’s letter to John Murray. Venice, 3 March, 1817. “The Armenian Grammar is published — that is, one. The other is still in MS. My illness has prevented me from moving this month past, and I have done nothing more with the Armenians.”—Excerpt from Byron’s letter to John Murray. Venice, 25 March, 1817. Thanks to Byron’s letters, we are able to understand a little of the history of two grammar books, and of his experiences learning the Armenian language. Surprisingly, the books themselves make little mention of Byron or his contributions, in particular, A Grammar, Armenian and English. In the earliest editions, his name is entirely absent and no prefatory matter tells of Byron’s role. Perhaps this is because of the practical nature of the grammar book itself, or perhaps some disagreements between Aucher and Byron’s over the original preface created some ill will—we can only speculate. Later editions did make minor mention of Byron’s contributions as a translator, and his name did eventually work its way onto the title page. Besides honoring his contributions, it is easy to imagine that adding Byron’s name to the title page was a good way for the publisher to sell books. Thanks to Jules Renouard, we do at least have one copy of the book with an author’s preface that tells us a little more of a very interesting story. Aucher, Paschal. A Grammar, Armenian and English. Trans. Lord (George Gordon) Byron. Venice: Printed at the Press of the Armenian Academy, 1819. Print. Aucher, Paschal. A Grammar, Armenian and English. Trans. Lord (George Gordon) Byron. Venice: Printed at the Press of the Armenian Academy, 1832. Print. Aucher, Paschal. Grammar, English and Armenian. Venice: Printed at the Press of the Armenian Academy, 1817. Print. Moore, Thomas. Life of Lord Byron: With His Letters and Journals. Vol. 3. London: John Murray, 1854. Project Gutenberg. Project Gutenberg, 19 Aug. 2005. Web. Mesrobian, Arpena. “Lord Byron at the Armenian Monastery on San Lazzaro.” The Courier 11.1 (1973): 27-37. Print. “Lord Byron (George Gordon).” Poetry Foundation. Poetry Foundation, n.d. Web. 29 Jan. 2015. Vangelista, Massimo. “Lord Byron in the Armenian Monastery in Venice.” Letters from the Exile. N.p., 04 Sept. 2013. Web. 31 Jan. 2015. Images of Aucher and Byron’s A Grammar, Armenian and English, courtesy of a private collection. Ivan Aivazovsky’s painting “Byron visiting mhitarists on island of St. Lazarus in Venice” (oil on canvas, 1899) via Wikimedia Commons. A Grammar, Armenian and English. Venice: Printed at the Press of the Armenian Academy,1819. , 334,  p.; 20 cm. ; First edition. Thank you to PFG for his help with the translations.